Valencia became the first side to score five goals in the first half of a Europa League match as they thrashed Rapid Vienna 6-0 on manager Gary Neville's 41st birthday. Five days after Valencia won a league match under him for the first time, Neville saw his players race into a five-goal lead inside 35 minutes. Santi Mina scored twice and set up three more in a sparkling performance. The visitors improved after the break but Rodrigo wrapped up the win. Santi Mina, 20, scored twice and assisted three more goals as Valencia tore Rapid Vienna apart. The result matched Steaua Bucharest's competition record. With a Champions League place at stake for the winners of the Europa League, Neville could end the season on a high despite his side being 12th in La Liga. 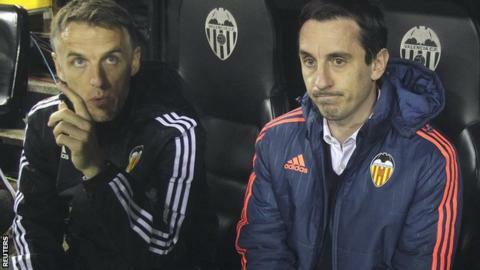 "Obviously the result makes it my best night in Valencia," Neville said. "But I've never celebrated victories halfway through the season. "I hope to start a positive run but it is dangerous to start thinking about turning points." Earlier on Thursday, holders Sevilla beat Molde 3-0 to take control of their last-32 tie. Former Juventus striker Fernando Llorente struck twice and Kevin Gameiro added a third as Ole Gunnar Solskjaer's men were well beaten. Villarreal will also defend a lead next week after beating Napoli 1-0 thanks to a superb free-kick from Denis Suarez, while Borussia Dortmund took a large step towards qualification with a 2-0 home win over Porto. Dortmund - who won the now defunct European Cup Winners' Cup in 1966 and the Champions League in 1997 - need the Europa League to complete the set of European trophies and were welcomed by an enormous banner at the Westfalenstadion. Right-back Lukasz Piszczek put them ahead when Iker Casillas failed to keep out his original effort before forward Marco Reus buried a low shot to finish a clinical counter-attack. Match ends, Valencia 6, SK Rapid Wien 0. Second Half ends, Valencia 6, SK Rapid Wien 0. Corner, SK Rapid Wien. Conceded by Antonio Barragán. Attempt blocked. Thanos Petsos (SK Rapid Wien) left footed shot from outside the box is blocked. Assisted by Matej Jelic. Foul by Álvaro Negredo (Valencia). Thanos Petsos (SK Rapid Wien) wins a free kick in the defensive half. Goal! Valencia 6, SK Rapid Wien 0. Rodrigo (Valencia) left footed shot from the centre of the box to the centre of the goal. Assisted by Rúben Vezo with a cross. Corner, Valencia. Conceded by Mario Sonnleitner. Corner, Valencia. Conceded by Deni Alar. Substitution, SK Rapid Wien. Deni Alar replaces Philipp Schobesberger. Rodrigo (Valencia) wins a free kick in the defensive half. Foul by Philipp Schobesberger (SK Rapid Wien). Attempt missed. Pablo Piatti (Valencia) left footed shot from the centre of the box is close, but misses to the right. Assisted by Santi Mina. Attempt missed. Matej Jelic (SK Rapid Wien) right footed shot from the left side of the six yard box is close, but misses to the left. Attempt saved. Matej Jelic (SK Rapid Wien) header from the centre of the box is saved in the bottom left corner. Assisted by Mario Pavelic with a cross. Attempt missed. Antonio Barragán (Valencia) right footed shot from outside the box is close, but misses to the left. Assisted by Álvaro Negredo. Substitution, Valencia. Antonio Barragán replaces João Cancelo. Thanos Petsos (SK Rapid Wien) is shown the yellow card for a bad foul. Pablo Piatti (Valencia) wins a free kick in the attacking half. Danilo (Valencia) wins a free kick in the attacking half. Foul by Thomas Murg (SK Rapid Wien). Foul by Javi Fuego (Valencia). Philipp Schobesberger (SK Rapid Wien) wins a free kick in the defensive half. Foul by Pablo Piatti (Valencia). Srdjan Grahovac (SK Rapid Wien) wins a free kick in the defensive half. Attempt missed. Philipp Schobesberger (SK Rapid Wien) right footed shot from outside the box misses to the left following a corner. Corner, SK Rapid Wien. Conceded by João Cancelo. Attempt missed. Thanos Petsos (SK Rapid Wien) right footed shot from a difficult angle and long range on the left is close, but misses to the right from a direct free kick. João Cancelo (Valencia) is shown the yellow card for a bad foul. Foul by João Cancelo (Valencia). Philipp Schobesberger (SK Rapid Wien) wins a free kick on the left wing. Substitution, Valencia. Rodrigo replaces André Gomes. Attempt saved. Thomas Murg (SK Rapid Wien) left footed shot from outside the box is saved in the centre of the goal. Assisted by Stefan Schwab. Srdjan Grahovac (SK Rapid Wien) is shown the yellow card for a bad foul.